Low and behold, the much despised Vladimir Putin is suddenly the hottest ticket in town at the G20 summit. 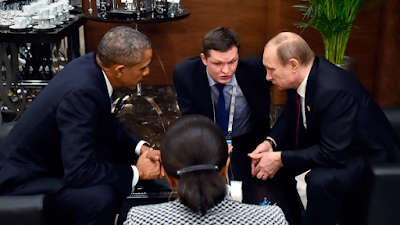 Please consider Putin Transformed from Outcast to Problem Solver at G20. Vladimir Putin left last year’s G20 meeting in Brisbane early in a huff, tired of being chided by world leaders over Ukraine. Twelve months on, an audience with the Russian president was one of the hottest tickets in town, as western leaders were forced to recognise the road to peace in Syria inevitably runs through Moscow. Few at the annual summit of world leaders have seen such a transformation in their fortunes, or appeared to enjoy it as much, as Mr Putin moved from a scolded diplomatic outcast to a self-styled problem-solver the west cannot ignore. Whether it was shifting air strikes to target Isis rather than Syrian rebels, or backing a political settlement in Ukraine and offering a debt restructuring deal, Mr Putin felt he held all the cards as the west came to him for answers. While progress this weekend in the Vienna peace talks on Syria has exceeded expectations, it will now enters a fraught period involving shepherding and bringing order to the ranks of more “moderate” rebels in Syria, who would partake in a transition process and unity government. Until there is official consensus on that, Mr Putin can continue doing what he has been doing: bombing the rebels and at the same time trying to engage and pressure them into talks with Mr Assad. Washington and Moscow may agree on the strategy, said Yuri Ushakov, Mr Putin’s foreign policy aide, but on “tactics” they are still far apart. The depth of mistrust still to overcome with the US was captured by Mr Putin himself. “It is difficult to criticise us when they tell us: ‘You are not hitting [Isis]’, and we say: Tell us where, name targets’, but they don’t,” the Russian leader said. The Financial Times reports France’s François Hollande Urged to Rethink Syria Strategy. François Hollande vowed to “crush” Isis, the terrorist organisation that launched suicide attacks in Paris. But the war rhetoric has come under fire from critics at home, who question the French president’s strategy in Syria. On Monday, Mr Hollande said he would deploy France’s aircraft carrier, the Charles de Gaulle, to the eastern Mediterranean later this week, trebling France’s military capabilities in the region. He called for a single coalition to fight Isis, which has won a swath of territories in Syria and Iraq. He hinted at a possible alliance with Russia’s President Vladimir Putin, who is providing military support to Bashar al Assad, the Syrian leader France has vowed to topple. Yet, opposition leaders, intelligence and military experts are questioning the choices that guide France’s intervention in Syria. “Let’s draw the lessons of past experiences: things have only worsened in 10 years, things are worse in Libya, Afghanistan, Iraq,” said Dominique de Villepin, former foreign minister, who opposed the US war in Iraq in 2003. Opposition leaders are instead pushing Mr Hollande to revisit his tough stance towards Mr Assad, whom many in France believe is key to winning Russia’s support in the fight against Isis. Straight after a meeting with Mr Hollande on Sunday, former president Nicolas Sarkozy requested an “inflection” in France’s foreign policy. “We need everyone to help fight the Islamic State, notably the Russians,” he said. But other experts are sceptical. “Assad is part of the problem, not the solution, and as the last few months have shown, he is barely capable of controlling his own territory,” said Jonathan Eyal, international director at the military think-tank RUSI. But three days after the worst terror attack on French soil, Mr Hollande hinted at a change of tack. The ultimate outcome of a political transition in Syria cannot be Assad, he said, but “our enemy in Syria is Daesh”. The world appears to be slowly coming around to my point of view on Russia and Assad. It's too bad it took a brutal terrorist attack to cause that rethink. But it's not a done deal yet. Politicians have a knack of snatching defeat from the jaws of victory at the last moment.